Today’s Thursday’s drawing is a final drawing rather than a project, it was done in two sittings. Looking for a theme of strength I thought what better than a lighthouse that has stood the test of time. 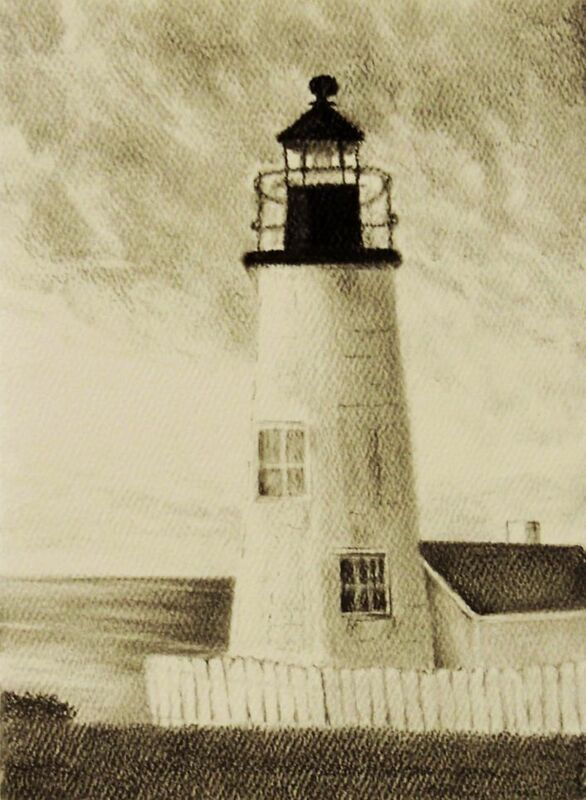 Pemaquid Lighthouse (located in the State of Maine), is a graphite and carbon (7×5) drawing done on a cream-tinted blank notecard. The surface is textured, which added a wonderful element of interest in person, but unfortunately doesn’t photograph too well (sorry about that). The graphite pencils used were: 2H, HB, B, 3B/4B. Carbon (2B) was used for the top of the lighthouse to give it a dark, non-reflective appearance. A kneaded eraser created interesting effects in the sky and water. Also to note that the fence was developed using negative drawing. Thank you for checking in ~ click onto the image for a clear view of details. This entry was posted in Drawings, Thursday Drawings and tagged art, drawing, fine art, graphite, lighthouse, Maine, pemaquid lighthouse. Bookmark the permalink. A wonderful feel to this drawing-lovely. Thank you Elena – it was an enjoyable project, felt like I was back in Maine. I hate the cold and love lighthouses, Mary, so you know which of your last 2 posts is my favourite. This is beautiful 🙂 Hope you have a lovely and productive week. Thanks so much Jo – glad that you enjoyed the lighthouse, it’s one of Maine’s gem. Absolutely adore this. I love that you can’t tell which time period it’s from. If you told me this sketch was from the 1800s, I would believe you. Very cool – I really enjoyed your reaction to this drawing. Thank you! That’s a beauty, Mary. The shading is remarkable. There is a no time atmosphere here! And yes, Maine is a place I would like to visit…by now I just enjoy seeing it through your eyes! Thank you Robert and appreciate your generous compliment. Thank you for your amazing reaction!! Can’t tell you how much I appreciate your words of encouragement. Hope you have a lovely bright weekend ! Always enjoy reading your comments Poppy and sometimes laugh right out loud. This was fun and glad you noticed the effects – just having the best time playing around with all these tools to draw with. Hope you’ve had a wonderful weekend and best to you for an awesome week ahead. Love the use of this textured yellow paper it gives an antique vibe which fits perfectly with the subject. Love your light houses and this one is no exception, wonderfully executed Mary. Hi Eva, thank you very much for your feedback, love “antique vibe.” The piece is a card and was real happy with how it turned out – from a card to something that will work well within a frame. Hope you are well and that you had a beautiful weekend. Have a wonderful week ahead. Thank you Sylvia – really appreciate it! It’s is such a distinctive lighthouse, I loved drawing it. I like the grit/texture. Makes it feel stormier, somehow. Hi Mary, i would suggest you to post larger pictures…they would look life-size and awesome! Hi Alok, thank you for your suggestion!! Just beautiful, your work continues to amaze, surprise and provide such joy. Thank you for sharing. Thank you for your lovely comment and compliment, means a lot. I’ve tried to get to your blog a number of times, but when I click onto your blog name, the system is not recognizing the proper link to your blog. Thank you Cynthia and so happy that you enjoyed this drawing. Thank you Lulu!!! And, why am I not surprised ~ Maine the State is filled with some amazing lighthouses. Mary, I quite like the textured effect! It makes me think of street art painted on textured walls. I love the cracks & pits in the brick or the roughness of stucco, which is akin to your textured card. Hi Resa, thank you and glad the textures appeal to you. I can see why they would remind you of the many surfaces street art is painted on. This was a neat little scene to draw out. love the details in the lighthouse, Mary. Thank you Geralyn – loved drawing the lighthouse, wonderful old structure. Beautiful on this textured paper. Something about this picture really captured my attention. It’s beautifully done. Thanks for sharing it. Thank you very much – glad you enjoyed the scene. Thanks very much Janet – the sky gives the scene that great atmosphere letting the lighthouse stand strong against the elements. Thank you Marina – hope you have a lovely and wonderful weekend. Ah, Mary…how well I know that lighthouse! And you have rendered it perfectly. I love the negative drawing and especially the texture of the paper coming through. (It’s quite visible in the enlarged version.) Thank you! So glad Cynthia and thank you very much. I look at a print we have of Andrew Wyatt’s Pemaquid and, well his work is so inspiring, I decided to give the lighthouse a try. Was a little worried about using such textured paper, but the graphite handled it well and it compliments the scene. Always enjoy your artistic view and feedback, thank you for always being present. Lovely! It looks great on the cream paper! A lucky person will be the owner of this awesome card! Thank you Rhonda – I choose the cream tinted paper to give the scene an older look. 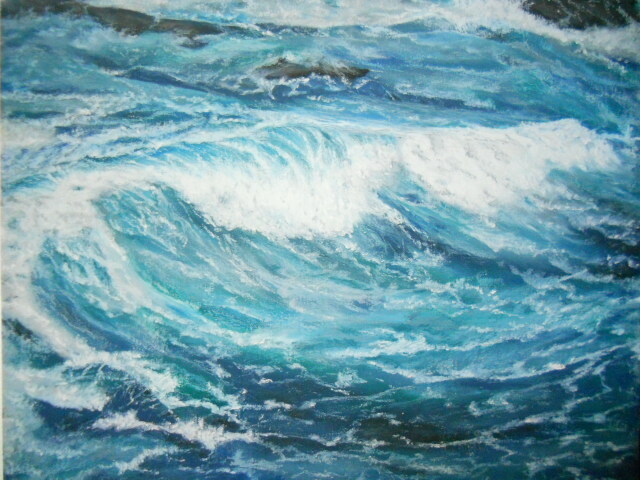 Thanks again ~ Best to you this weekend – plans for any boat painting? No boating. The season is over. They draw down the lake about 8′ and it’s hard to launch a boat. Have a super weekend. That’s interesting, never heard of that before. Why do they draw down the lake? To make room for next springs snow melt. I love lighthouses, Mary! You did a fantastic job…bravo! Yeah Jill – they are gorgeous structures with wonderful history. Thanks so much and glad you enjoyed her! One of the loveliest Maine lighthouses. Nice job, Mary. Thank you Evelyne. The lighthouse is one of grace and rugged strength – I just love it.